For some rooms in your home, vinyl is a perfect choice. And when you walk into your local flooring dealer, you might be surprised by the many options available when it comes to installing vinyl in your home. But did you know that selecting the right backing is equally as important as the color, style, and pattern? Sure, you’ll have to live with the design and be happy with the look. But if the performance is off from the beginning, you’ll regret your choice no matter how beautiful it is. The right backing adds durability, water-resistance, and determines how your flooring will wear. It also determines how it will be installed. Let’s talk about two of the most popular types of backing available on vinyl floors. 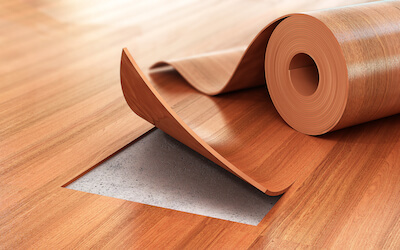 If your vinyl flooring has a felt backing, it must be installed with permanent adhesive so it will stick to the subflooring. Otherwise, it may start curling on the ends over time. The installation process is a little more tedious as the subfloor must be primed and ready to go. The proper amount of adhesive must be used to ensure they vinyl is properly attached to the subfloor. Tiles will also be a little more difficult to remove. Because felt backed tiles will adhere to the floor, it is important to acclimate them to your home before installation. Leave them to sit for at least 24 hours to allow them to adjust to room conditions. Felt backed tiles are not recommended for basements or any room where they will come in contact with consistent moisture or water. Fiberglass vinyl is growing in popularity due to its simpler installation process. It can be installed with releasable adhesive or no adhesive at all, making it easy to lay and replace towels if they become wet or damaged. Fiberglass doesn’t have the curling problem associated with felt back vinyl. It also won’t shrink, crack, or warp with exposure to varying elements. Fiberglass is also known for its muting qualities. It’s softer underfoot because of its thickness, which also adds to its noise-reducing qualities. That makes it a perfect choice for rooms you might not have considered before, such as living spaces. Fiberglass is helping redefine how you think about vinyl flooring and gives it a step up in desirability for installation in your home. If you have any questions about vinyl flooring, give us a call and talk with one of our representatives.